Posted by Jon in DC, Mezco, One:12, Review with 0 comments. Some would say that Wonder Woman has been the one bright spot in an otherwise directionless and disjointed DC Cinematic Universe. I don’t know if I completely agree with that, but it was a decent and enjoyable movie. It seemed to run out of steam for me towards the end, but I find that most superhero movies tend to finish weak. It’s been a little over a year since preorders opened for Mezco’s take on Gal Gadot’s Wonder Woman. During that time I believe we’ve also gotten figures of her from S.H. Figuarts, MAFEX, and Mattel, so there is a lot of competition in the 6-inch scale field. Was Wonder Woman worth the wait? Let’s go ahead and take a look. If you’ve been collecting Mezco’s One:12 Collective figures for a while then you know what to expect out of the box. For those who are new, welcome! Wonder Woman comes in a window-box with a slide cover over top of it. She includes the following accessories: 3 pairs of optional hands, 2 heads, Sword of Athena, shield, a Lasso of Truth that can hang off her belt, a loose Lasso of Truth, and a display/flight stand. I think the spread of accessories are good for the character. An effect piece similar to the muzzle-flashes that came with Punisher would be a nice inclusion; like a spark from a bullet bouncing off of her arm-guards. 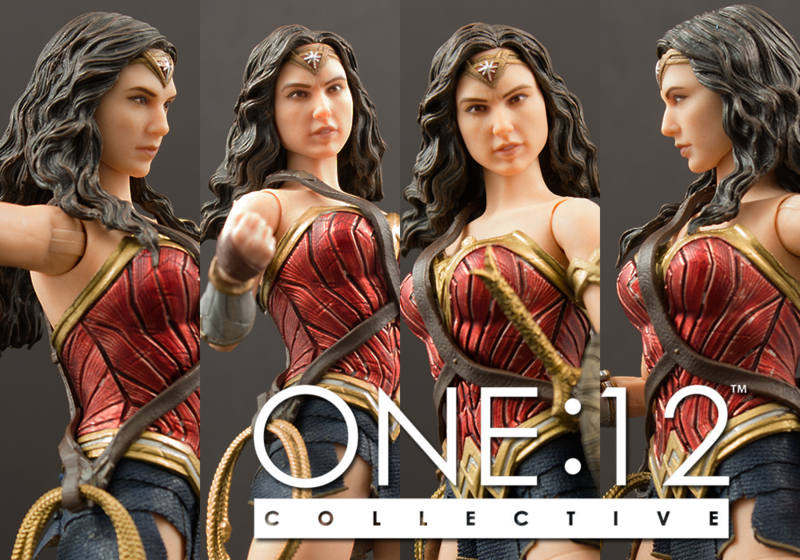 A major draw of Mezco’s One:12 Collective line is the tailored clothing. This puts Diana in an odd spot because the only cloth part on her figure is the skirt. Her top is a soft plastic overlay which unfortunately blocks off any kind of torso or waist movement. It’s unfortunate that her upper body is so static because the range of her hips and ankles are pretty great. If she had a little more articulation up top she could probably hit some great crouching poses. Finally, let’s get around to likeness. Even from the get-go I’ve never thought the Gal Gadot likeness was perfect. I believe they’ve made some improvements since their original solicitation, but it’s still not quite there. At least not when you look at her straight on. Both side-profiles are actually really good, almost perfect. My guess is that they made her cheeks a little too full. This ends up causing her face to look great from both sides, but if you turn her directly towards you it starts to look off. Would I suggest Mezco One:12 DC Wonder Woman? If you are a big fan of the character and/or movie then this figure is a no-brainer. It’s absolutely gorgeous and comes with everything you should need for a movie Diana. However, if you are more of a DC casual like myself, the $80 price tag might be a little harder to swallow.